On November 8th, 2018 Jupiter will return to one of his signs of rulership in the mutable fire sign of Sagittarius. This means that all the best qualities of Jupiter, planet of blessings and benevolence, will ripen into fullness and potency. Thus, consider this thirteen month transit between November 2018 and December 2019 to be an extended holiday of positive growth and opportunity. That your season in hell has finally ended! After a long hard night, what is more awe-inspiring than the sunrise? Like the warmth of the morning upon your face, this passage of Jupiter into Sagittarius will stir new depths of heartfelt gratitude. During this last Jupiter transit, how did you fall prey to cruelty, overindulgence or escapism? How were you tempted to sacrifice your soul for the attainment of power? Your season in hell was a journey into the depths of your own weakness and self-hatred. The 13-month transit of Jupiter through Scorpio was an intense study of what darkness had to be transformed within yourself. Everyone is scared of their own shadow. And you are not alone if you have felt emotionally devastated by some of your recent lessons. But your heart is like a hearth, a warm space of creation that contains the divine love of the universe. With Jupiter’s entrance into Sagittarius, the fire of your spirit will set your heart aflame once again. By this light, the fullness and ripeness of life will once again be realized. This recognition of divine providence is all you need to prepare for a season of joy, prosperity and growth! Click here to get your *FREE* horoscope for Jupiter in Sagittarius! Stand Next to Your Fire! Jupiter is enthroned in the mutable fire sign of Sagittarius, where his energies are expressed through exultant grace, benevolence and charisma. In Sagittarius, Jupiter expands the eternal flame within, opening your heart to the beauty and magnificence of life. Feel greatly encouraged by your heart’s renewed desire for the creation and procreation of joy! It is in Sagittarius where the spirit explodes into the sky in search of truth. The image of the centaur with the arrow pointed at the stars tells the story of spiritual evolution. First the spirit finds expression through the forces of nature, best exemplified in the galloping strength of a horse’s legs. Next, the spirit seeks refinement through the higher mind of reasoning, by the head that leads the horse’s body. And finally, the spirit seeks expansion through imagination, inspiring the centaur to shoot its arrow into the vast cosmos. It is in the fires of Sagittarius where the mind and the heart are melted together in perfect unity. One of Jupiter’s gifts is the conception of holiness or wholeness in one’s being. The holiness of Jupiter is what gives rise to the experience of faith. The highest form of relationship with Jupiter is to have an unshakeable faith in divine providence, where abundance and prosperity appears immanent. If you struggle with having faith in the benevolence of the universe, if you are shaken by the fear of drought, famine, and scarcity, then this transit of Jupiter through Sagittarius will guide you back into the flow of flourishing love and support. In astrology, Jupiter is called the Greater Benefic, and is associated with many benefits and blessings. Jupiter’s influence is known to expand and magnify, making this the planet of good fortune, wealth and generosity. Jupiter was the Roman name for the supreme deity of the heavens. His other name was Jove, which is the root of jovial. It is joviality that best expresses the spirit of Jupiter in Sagittarius, one that is generous, cheerful, optimistic, and expansive. Jupiter in Sagittarius is very fortunate. But it is an energy that seeks to support and expand much more than monetary wealth. This is a transit that is meant to guide you towards appreciating the full richness of life. Jupiter in Sagittarius begins a quest for wisdom. To better understand the pulsation of deep love in the universe you will begin to search far and wide for instructive experience. “Ah! But Are You Experienced? With Jupiter in Sagittarius, expect your horizons to be expanded, your mind like a telescope absorbing light from the farthest reaches of outer space. New mentors and teachers may arrive to guide you. Know that they may be from the most prestigious or humble places. You may be called to travel far from home to explore the wisdom of another culture. You may be inspired to find a new school or spiritual community. Or you may simply find a book that opens you up to a new universe within. However it unfolds, Jupiter in Sagittarius is the time to have faith in your journey. It is time for your spirit and soul to be fed. The most significant aspect that Jupiter in Sagittarius will be making this year is a series of squares to Neptune in Pisces. When Jupiter touches Neptune, you will become vulnerable to enchantment. Blind faith is not the path you’re meant to follow. You will be corrected wherever you fall prey to that. The first square will occur on January 13, 2019. The slippery siren calls from the Neptunian sea will test your capacity to discern truth from fantasy. It will be easy to get lost in delusions, lost in the glamour of what seems like passion, romance, or wisdom. The second square will occur with both Jupiter and Neptune in retrograde on June 15, 2019. Your newfound spirit of love and generosity may crumble when your trust and good will is first betrayed. From this experience, you will learn the danger of wishful thinking. And from this spiritual crisis you will be led to return to higher love. The culmination of these squares will occur on September 21st, 2019. It would be wise to remember that if it sounds too good to be true, it is not true. But the new level of discernment for truth you have gained is a great spiritual treasure. It takes twelve years for Jupiter to circle the entire zodiac. Therefore, during this transit of Jupiter in Sagittarius, some essential wisdom from your life experience over the last 12 years will begin to bloom. Throughout the upcoming months you will know, beyond a shadow of a doubt, that a fulfilling life does not arise from mere pleasure-seeking. That is a blind path that leads nowhere. By the light of the eternal flame, the full bloom of life and all of its richest nectars arise from experience, with pleasure, pain, innocence, and suffering like petals spiraling back to the same center. From this viewpoint, you see how all your life experience has been enriching, all of it swirling into a nectar of joy. At this crucial moment of revelation, your heart knows the nature of love and eternity. To quickly attune to the richness of the Sagittarian spirit, let yourself sit back and experience a complete performance of Beethoven’s Ninth Symphony. The Ninth Symphony is filled with truth that can inspire you to believe in yourself when nothing else will! In this music, you’ll hear how any darkness can be overcome. And with this music inside your heart, the world’s oppression is answered with the holy spirit of love. In 1824, on a balmy spring day in Vienna, Ludwig van Beethoven premiered the Ninth Symphony. By this time in his career, he was almost completely deaf. For a great composer to lose their hearing is a tragedy, but being a Sagittarius Sun, Beethoven did not let it stop him. With the real conductor hidden off to the side, Beethoven stood center stage and wildly threw himself into his own imagination of sound, no doubt feeling the vibrations of his greatest artistic triumph resounding far into the future! The end of the Ninth Symphony is famous for the Ode to Joy, whose lyrics were written by German philosopher and poet Friedrich von Schiller. Beethoven had long admired the works of Schiller and he used the lyrics of “Ode to Joy” to express his belief in the triumph of the human spirit over all opposition: whether that be war, oppression, or even physical ailments such as his own agonizing deafness. The inclusion of Ode to Joy in the Ninth Symphony was a subtle, yet rebellious act. In 1824, the Napoleonic Wars had ended and the monarchs of Europe had restored power. Therefore, the revolutionary and libertarian ideals that had exploded into fruition at the end of the 18th Century were again heavily censored and criminalized. Nevertheless, Beethoven’s Ninth Symphony fearlessly declares a belief that “brotherhood unites all men”, which at the time was anathema to the repressive political environment of Europe. The Ninth Symphony is a bombastic invocation of the Romantic spirit: an anthem to liberty and an Ode to Joy! The Ninth Symphony is the sound and fury of human courage, whose true source is found in the swelling tenderness of the human heart. As Jupiter transits through its home in Sagittarius, let yourself be enriched and inspired by the spirit of Beethoven, who rose out of a black hole of suffering to create music that inspires the world to this day. Hear the Ode to Joy as the voice of Jupiter himself. “O friends, no more of these sounds! In conclusion, this transit of Jupiter in Sagittarius will be a time for your eyes to open to a much bigger vision of the world. Guided by faith and the light of the divine, this will be a time for you to bloom, flower and flourish. But in order to receive, you must continuously give. Your path of spiritual development will ask you to let the warm glow of love shine upon any beliefs that separate you from others. Where your heart has been hardened, you’ll be asked to soften and forgive. Learning to be generous without prejudice is not an easy task, but it is the path that offers the most expansion. The wisdom of Jupiter rests upon the fact that all gifts are meant to be shared. If you have a light, then you must shine for others. If you have knowledge you must teach. And if you have food, you must feed. Whatever happens, remember that you are whole and holy. Many Jupiter blessings to you! 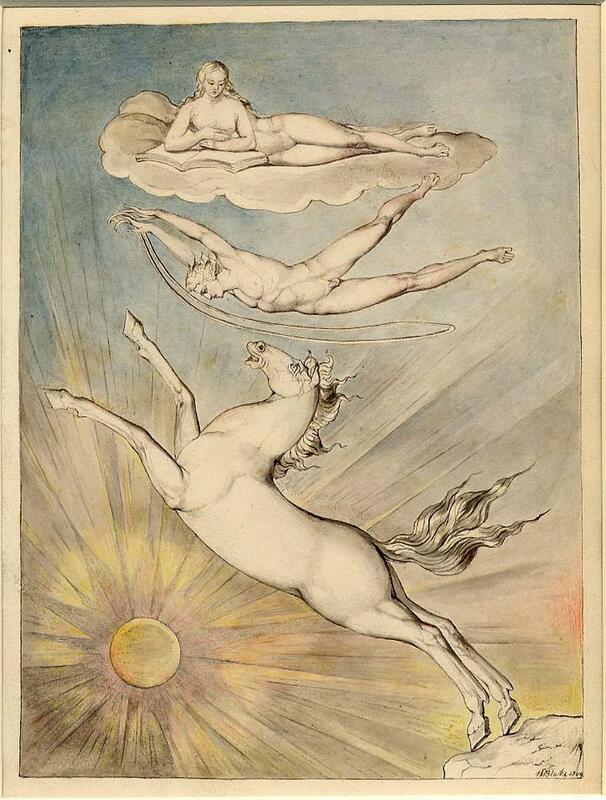 *The Sagittarian spirit was evoked through the art, words and images of Jim Morrison, Jimi Hendrix, William Blake, and Beethoven: all born with the Sun in Sagittarius.